Check out for Latest Cricket News, Specially T20 Cricket News! IS Bindra, a member of the IPL governing council and the ICC's chief adviser, has called for a fair trial for Lalit Modi, suspended on charges of financial impropriety, and criticised the BCCI and the media for the manner in which Modi was targeted. Modi was suspended by the Indian board shortly after the IPL final on April 25, and was given 15 days to respond to the charges levelled at him. Bindra while claiming he was not defending Modi, referred to him as the "hero of the IPL" and credited him for India's envied standing and clout in international cricket. "Let us not forget that everyone is entitled to a fair trial," Bindra was quoted by PTI as saying. "I can opine with conviction that part of the blame lies with our own cricketing fraternity for being an instrument in leaking all kinds of unconfirmed reports without veracity or merit. "The media has been ready with the guillotine to hang the hero of the IPL. He has been accused of match fixing, rigging of bids, laundering of money, and all kinds of allegations pertaining to financial irregularities and dealings based on unsubstantiated evidence. "It was due to the marketing genius of a maverick - Lalit Modi - that Indian cricket finally emerged as a colossus in the international firmament in terms of reach and financial clout. Indian cricket became the epicenter of world cricket and the envy of the cricketing fraternity during this key phase." 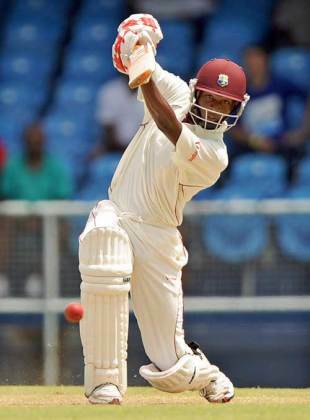 West Indies have named left-handed opening batsman Omar Phillips as replacement for Adrian Barath for West Indies A's upcoming tour of Bangladesh. Barath, who made a memorable century against Australia on his Test debut last November, withdrew from the tour with an injured right knee and will remain in Trinidad to do rehabilitation work. Phillips, 23, plays for the Combined Campuses & Colleges and had a similarly promising start to his Test career last July, albeit against lesser opposition. He made 94 against Bangladesh at St Vincent when many first-choice West Indies players were missing due to the contract dispute. The tour begins on May 4 with the tri-series at the Khan Shaheb Osman Ali Stadium in Fatullah. Phil Simmons, the Ireland coach, has accused his side of 'complacency' after they slumped to defeat against Afghanistan in the World Twenty20 warm-up game on Wednesday. Ireland lost 3-0 to West Indies XI earlier this month and were also defeated by New Zealand on Tuesday. It's a sequence of results that does not bode well for a side that has a proud record in global tournaments recently and Simmons could not hide his disappointment after a lacklustre performance that saw Ireland slip to 32 for 5 at one point. "I can't express my thoughts," he said. "We didn't start the game well. We can't have five wickets down for 30 runs in eight or nine overs and expect to be competitive in a game. It's a case of complacency and bad batting as a whole. We've just got to make sure that we get rid of that complacency." Ireland's batting woes have hampered the side since arriving in the Caribbean. They have passed 150 only once in the five Twenty20 matches they have played but Simmons insists his team can bounce back. "We lost four going into the World Twenty20 in England last year and we lost two coming into the [50-over] World Cup here three years ago so that does nothing for us," he said. "The thing about it is that before yesterday and today we had done everything that we wanted to do leading up to the competition. Two days doesn't change anything. I think it's a case of us making sure that between Thursday and Friday morning that mentally we get prepared for what it the biggest game since we've been on this tour." Ireland play their opening match on Friday against Simmons' native West Indies at Guyana. "We've had two bad days but two bad days don't make a summer, as they say. I think we still have the desire to come on Friday and perform."